2015 will soon be upon us. (Can you believe it?) If you're like us here at Home to Indy, we love New Year's Eve. It's a time of looking back over the past year. What did the last year hold for you? Did you purchase or sell a home? Perhaps you moved to a different city. If you are looking for some ways to celebrate the new year in Indianapolis, you've come to the right spot. Here are just a few of the many options available to us here in Indy. Editor's Note: We know we're posting this early, but we wanted to give you time to plan. Mayor Ballard announced in October that Indianapolis will have its first annual community-wide New Year's Eve celebration! The party will include food and music by The White Panda. While other cities have a ball drop, Indianapolis will have an Indycar hoisted high above the crowd that will descend (with fireworks) at midnight. It sounds like a party you won't want to miss! Kick off 2015 at Hyatt Regency Indianapolis. This action-packed night of entertainment and celebration includes several live musical performances on three stages, a fantasy casino "player's lounge" and a massive midnight balloon drop in the center of the hotel's magnificent 21-story atrium lobby. $40 tickets are available without the purchase of a room. ComedySportz will host a family-friendly night of fun at the Athanaeum Theatre on Mass Ave. Shows are at 7:30 p.m. or 10:30 p.m. Ticket prices range from $18-$20. You supply the suggestions. They'll supply the hats and the laughs. End the year with a bang with a family-friendly alcohol-free celebration in the Governor Frank O'Bannon Great Hall. Face painting, stilt walkers, clowns and music will highlight the evening. A balloon drop at 8:00 p.m. allows the little ones to celebrate the New Year in style. Reservations are recommended. Cost is $7 for members and $13 for nonmembers. 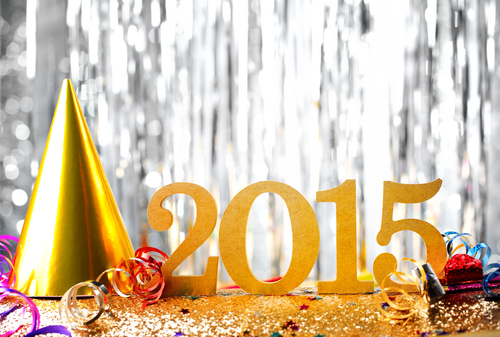 Ring in 2015 at a glamorous New Year's Eve party! Celebrate the New Year in style at the IMA surrounded by art, champagne, food, live music and dancing. All galleries will be open, including the special exhibition Georgia O’Keeffe and the Southwestern Still Life. Enjoy international interactive cuisines throughout the Museum and sip on luxury cocktails while taking in the glitz and glamour. Cost is $125 for members and $150 for non-members. Wherever you end up celebrating, we hope you have a Happy New Year!